Every year around May, a bunch of us get together and go for a walk and in various configurations; have been doing this for last 18 years. Essentially it's a good opportunity to moan on about the state of things, catch up with each other and drink large quantities of beer. 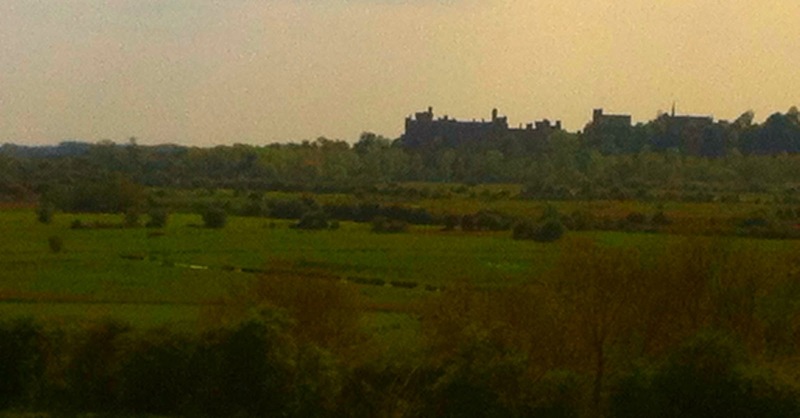 Key requirements are good countryside, good pubs and good accommodation. Generally speaking all the trips take place in the UK (we went to Belgium once when the UK countryside was closed down with foot and mouth) and after years of getting soaked in the north and west there has been a shift in sentiment towards the south-east. 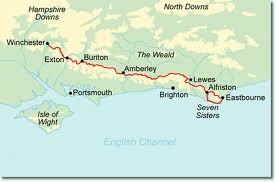 I live in Brighton, love walking on the South Downs and pushed the idea of the South Downs Way (SDW). Because it was my idea and because I had always managed to avoid doing it in the past, this year the task of planning the walk fell on my shoulders. To be honest it wasn't a tough task. The SDW is a National Trail and there is an excellent web site which has all the information needed to plan a trip. To allow maximum time for beer consumption and recognising the physical composition of the group I went for an 8 day schedule which, for a 100 mile trail, is fairly relaxed but seemed to be the schedule most of the groups we met along the trail were on. We were carrying our own overnight gear ignoring the bag carrying services available on the route. All the accommodation we stayed at was listed on the SDW website although the main constraint I had was finding places big enough to accommodate seven people - a lot of the accommodation listed is bed and breakfast with a very limited number of bedrooms. All of us in the group are in or near retirement and fondness of the good life means that, for some, maintaining the perfect score on the Body Mass Index is proving just a bit difficult. The creams and potions needed to keep various body parts appropriately lubricated meant that some of us were also carrying large medical kits and this, combined with hideously heavy leather boots, meant that a lot of weight was shifted between Winchester and Eastbourne. This year, for the first time ever but the for last part of the walk only, "other halves" were allowed to join what is normally a men only trip and this increased the party size to twelve. Not quite sure how this radical departure from tradition happened but in part it was because the trip was longer than normal, 8 days instead of the usual 4, and this made the men only rule a bit more selfish than usual. 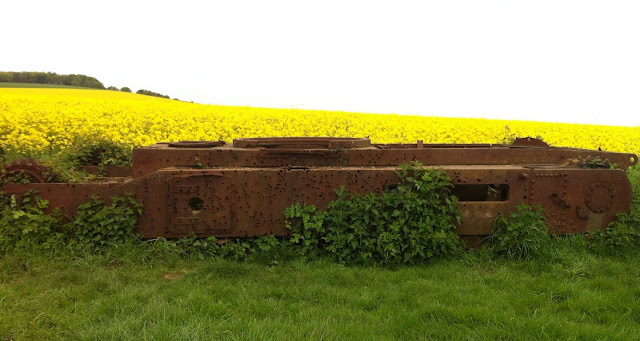 So how was the SDW and, after walking across Europe, did I find anything in the south-east of England that was new and interesting? Well, first and foremost, you know you are on the SDW, it has some distinct characteristics which are sustained almost from one end to the other. These characteristics stem from the underlying chalk geology. For most of its journey the SDW runs east/west along an escarpment, the southern remnants of chalk anticline the centre of which has been eroded away exposing the older and harder rocks of the Weald with the northern remnants, a mirror image of the South Downs, emerging as the North Downs. Although the escarpment is rarely more than 250 metres high it's a dramatic feature, and from the bottom of the scarp face it dominants the sky-line and is particularly prominent on the train south to Brighton. So the SDW is a ridge walk but a ridge walk which is definitely not flat. The biggest descents and ascents are caused by the rivers Arun, Adur, Ouse and Cuckmere slicing through the ridge from north to south to the sea. The valleys formed by the rivers are interesting features in their own right. Near the sea they have wide flat bottoms and both the coast line and the course of the rivers has been subject to many quite recent changes, particularly as long shore drift blocks their exit to the sea ( long shore drift composed of pebbles from the river bed of the Rhine which extended along the English Channel during the last ice age). In addition to climbing in and out of the big valleys the ridge walk is also marked by a series of smaller ups and downs associated with dry valleys, a remnant of melt water from the last ice age when the frozen surface of the normally porous chalk rendered it the subject of rapid erosion. These dry valleys are often wonderful features, gentle curving amphitheatres cut out of the ridge which, particularly when the sun is low, present a lovely shadowed landscape. Despite the valleys the SDW is still essentially a ridge walk and a ridge walk with great views. To the north you get views across the Weald to the North Downs beyond; to the south it's views of the coast line including; at the western end, the Isle of Wight; and from the central section of the route you get great views of the South Downs scarp itself looking both east and west. Conditions underfoot also owe much to underlying chalk geology. It's usually dry (although it can be horribly sticky when a frost is melting) and you can walk and cycle on it any time in the year. The best parts are also covered by lovely spongy grass, chalk turf formed by generations of close grazing by sheep, which until quite recently was the predominant form of agriculture on the Downs. The trail itself is essentially off-road and based on an ancient stone age route which ran along the top above the boggy and densely wooded Weald below. In fact historic remnants are a feature of the walk with the route joining together sites of one hill top fort after another. You do have to cross some busy roads, roads which use the north-south valleys to get to the coast, but it's essentially a quiet traffic free walk. 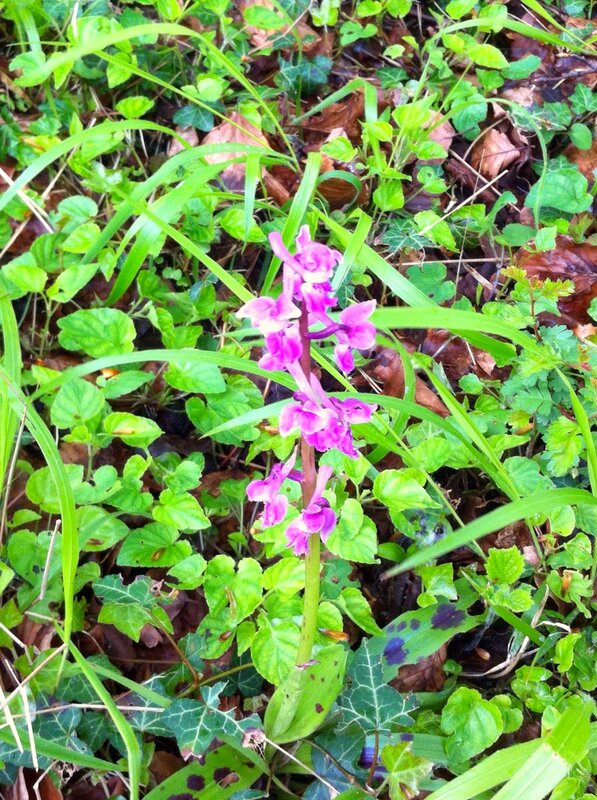 Early Purple Orchid or Spotted Orchid? For me May is the best time of year in England, spring is properly sprung, the long days are producing an explosion of fresh green growth and birds, in the early morning, are going absolutely bonkers. This is true for lots of places and is definitely true on the South Downs making it the ideal time to walk the SDW. It's a great time for wild flowers, in particular cowslips, buttercups, and orchids, lots and lots of Early Purple Orchid's particularly near Beachy Head. It's perhaps the best time to see beech trees, not so much because they are unusual but because at this time of year their fresh new leaves are spectacular. One thing which did disappoint me a bit was the accommodation and the pubs. I guess it's because I have spent so long walking in Europe but I'd forgotten just how expensive, relatively speaking, doing place to place walking is in England. Maybe it's worst in the south-east where property prices are so high but its hard work getting bed, breakfast and an evening meal for less than £100 per person. The equivalent in most European countries is half that. I was also surprised, perhaps shouldn't have been, at the decline of the traditional English pub in the countryside. Virtually all the pubs we went to were rural restaurants rather than pubs - and completely empty once people had eaten. Of course the differences across Europe are all to do the rate of change in the countryside and the fact that southern England, more so than anywhere else (although they are catching up) is now just one giant fabulously preserved rural suburb. Best to visit the countryside rather than live in it: that's what the urbanites in the group all concluded - at least you can still find a decent pub in the city. I did try and do a daily blog but I couldn't sustain it. It takes me an age to write anything and despite my disappointment at the death of the rural pubs, their remnants drew me in on a daily basis. I did manage some notes however and have pulled them together below. 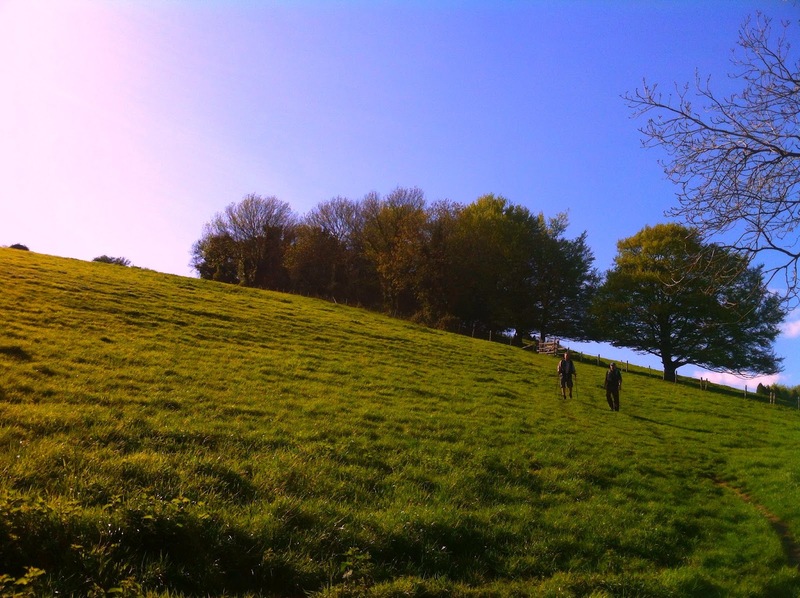 If you plan to do the South Downs Way hopefully you will find them interesting, with the comments on accommodation and where to eat helpful. Our first day's walk involved an 11 mile walk to Exton followed by another 2 miles south off the trail and along a disused railway line to Droxford. We somehow managed to miss the signs, if they exist, out of Winchester and didn't get onto the SDW proper until Cheesefoot Hill which is a couple of miles east of Winchester. It's a nice enough walk, through very pleasant countryside but the route has not as yet climbed up onto the chalk downland. The best views are from Beacons Hill just before Exton, where you can see right across south Hampshire to the Isle of White. Also enjoyed a mid-afternoon drink at the Milbury's, a pub famous for its indoor well which goes down nearly 100 metres and its indoor tread mill. Quite a lot of accommodation available in and around Meonstoke but none of it could accommodate a party of our size and we ended up staying at the Upland Park Hotel in Droxford. To be honest the hotel has perhaps seen better days and the owner, a very nice man, is planning his retirement and in the process of selling. Still it served its purpose and we got a lift next day back onto the trail. Another gentle days walk and for first time with the walk up the Old Winchester Hill, the site of a Stone Age Fort, you're onto the South Downs proper and it's a really excellent introduction. We stopped at the Whitewool Farm, a trout fishery for a mid-morning coffee and this coincided with a change in the weather, it rained for the rest of the day, the only really wet day of the whole walk. A shame really because the views approaching Butser Hill are supposed to be amongst the best on the SDW (we got glimpses through the rain and the beech trees) and Butser Hill is both the trail's highest point and the location the for start of Del Boy's famous hang gliding trip. The last and wettest part of the walk took us through Queen Elizabeth Forest Park with great stretches of both open down land and beech forest. It was also, when we were there, the location for a film shoot and extras dressed as Roman solders were nonchalantly having their lunch in the cafe in the centre of the park. There are two pubs in Buriton, the Maple Inn and the Five Bells. The Maple Inn has accommodation for large groups - accommodation is fine and the landlady was very helpful but the food and beer were poor. The Five Bells on the other hand, although we only drank there, looked a much better gastronomic option. The first part of the walk to Coulters Dean Nature Reserve is through trees with restricted views although at the reserve we do get to see our first orchid. Dave Smith announced with great authority that because it had got spots on the leaves it must be a Spotted Orchid - I now think his authority might be misplaced and that it was an Early Purple Orchid and the leafy spots were mildew. Frank, who I think talks with genuine knowledge on things natural and had already pointed out hops in the hedgerow, demonstrated the celery- like flavour of the stem of hog weed, and found a St George's Mushroom which he said are excellent sautéed. Just past the nature reserve we cross the boundary between Hampshire and Sussex, which also marks the original limit of the SDW before it was extended in 1991. After crossing a small road which goes down the scarp to South Harting (the next spring line village on from Buriton) you climb a small hill topped with a ruined tower - probably a folly - before carrying on to what I think was the best part of the day to Harting Down, a downland reserve, and then Beacon Hill. You can go around or over Beacon Hill but it would be a real shame to miss the views from the top - some great views back to the Solent and the Isle of Wight and forward to Goodwood and Chichester. The rest of the walk is lovely, very quiet and a mix of open country and woodland but still with lots of things to catch the eye. In the trees we come across a memorial to a German pilot shot down in the Battle of Britain, the mounds of a Bronze Age burial ground and some peacocks inside the Monkton Estate. There is nowhere on this stretch to get any food but Pete Williams provided some excellent birthday cake which we eat against a large log next to a much larger pile of manure. 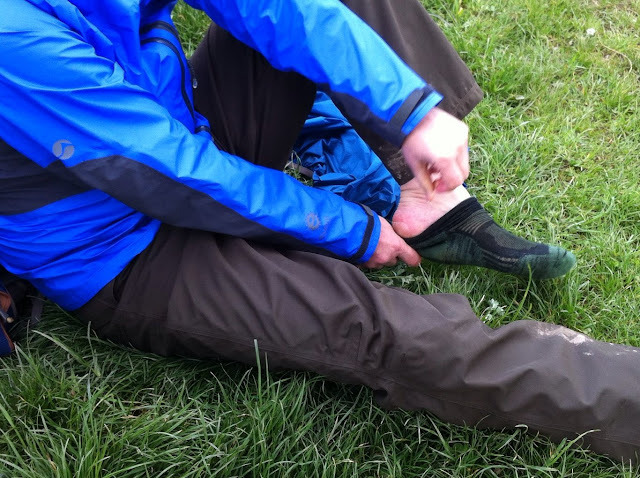 Frank reveals that he has a blister and stuffs Silver Leaf (a plant) into his boot which he claims is a cure. Eventually and after a long descent we cross the A268 just to the south of Cocking, climb the hill beyond (past a field full of young bulls) and then leave the trail and head down to Charlton. We stay in the excellent Woodstock House Hotel and eat in the equally excellent "The Fox Goes Free" - although in my book its more of a restaurant than a pub. The main early excitement was the temporary loss of Dave Harker. He was called by nature and missed the route on his return - last man Roger failed to spot this and Dave was missing in the thick forest, no phone signal, just north of Charlton. After 30 minutes or so, and the instigation of a pattern search, we managed to find him. We now need to now who was to blame and once Leveson has finished with phone hacking stuff we will be calling on him for a report. I have been accused of abandoning people in the Alps but as this event took place within English jurisdiction its more serious. After that excitement the rest of the morning was a bit of an anticlimax and indeed we spend a couple of hours or so walking through a fairly wooded stretch of SDW before the search parties joined together at the designated assembly point, Littleton Farm. After a gentle climb back onto the Downs the landscape opens up again and there are some great views east right along the scarp, and indeed the route stays 'open' now pretty well until the finish. Crossing Bignor Hill, Westburton Hill and Bury Hill we are eventually rewarded with views of the Arun Valley before dropping down to Amberley Station where we drop Frank off who has to nip back to London. We stayed at Burpham Country House which is a couple of miles to the south of the trail. Actually the walk to Burpham is good, great views of Arundle and through some lovely water meadows full of a huge variety of birds. The Burpham Country House was excellent, looked a bit Daily Telegraph for my taste, and we did wonder whether we should try and eat in the village pub. The pub, a pub in name only, was expensive and stuffy and the Burpham Country House confounded our prejudices and turned out to be great. Rather than retrace our steps to Amberley Station we cut the corner off heading across the vast open fields of the Duke of Norfolk's huge West Sussex estates. This meant we missed climbing up the Amberley Mount but did find the old abandoned tank which I've been looking for every time I come to these parts having first seen it five or six years ago. It's just south of the trail a couple of hundred metres to the west of Spring Head hill. The scenery is now classic SDW, completely open, with huge 360 degree views of the escarpment clearly visible east and best. Lots of earthworks around here, remains of ancient flint mines, views of quarries down below the scarp and a strange concrete structure encased in iron plates just before you descend down to A24. If you survive the A24 crossing then it's a climb up the other side and then onto top, some really excellent views and of course the wonderful Chanctonbury Ring, another stone age hill fort. 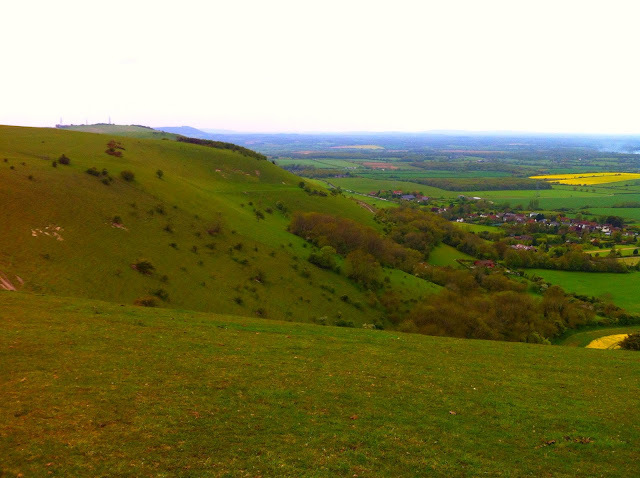 Actually Cissbury Ring to the south is the larger of the two forts but its northern partner is better located. We then headed south and joined the Monarch's Way, walk down into Bramber, across the Adur Valley, eat lunch at a pub before heading back up onto the Downs and onto Devil's Dyke. This meant we missed the walk around Steyning's Bowl a wonderful feature on the west side of the valley but I can easily come back for that. Roger and Dave caught the bus back to Brighton and missed the final stretch of the scarp- hugging walk. The views were great, completely open with barely a tree in sight, the sky huge with light reflecting from the sea to the south perhaps exaggerating the effect. There seems to be earth works everywhere although never quite producing anything as formal as the Cissbury Ring. Devil's Dyke is one of the most famous view points in the south of England, an escape for holiday makers when Brighton was in its heyday. It's hard to imagine now but demand was such that there used to be a railway line to bring visitors from the sea front up to the top of the downs and even a funicular for people wanting to take the shorter but steeper trip up from Poynings. We stayed in Brighton that night, eating in my flat near the sea front. The group now expanded as Frank returned along with five "other halves". The route now took me through very familiar territory, including the places where I go for a quick half day walk from home, and to be honest, its hard to look at it with fresh eyes. The bit I have never done is the mile or so between Devil's Dyke and the Jack and Jill Windmills, I usually start at these points heading west and east respectively and miss out the bit in the middle. This means I have always missed Saddlescombe and the lovely Hiker's Rest, a little cafe on the farm there. Still I was back on familiar ground once I got to the windmills (Jill Windmill has been fully restored and produces stone ground flour from local wheat) but was amazed to see how well used the route is and even on a Friday there were loads of walkers, runners and cyclists out having fun. Although familiarity does make me take this stretch of walk, with its huge views, for granted, it still has the capacity to surprise. I loved the view back, from just beyond Ditchling Beacon, all the way to Chanctonbury Ring, we were there just before lunch on the previous day but it looks an impossible distance away, really impressive. Have to say that the only significant impact of the involvement of woman in the group was the sudden injection of pace. Conversation flowed just as much as ever but we were walking at what seemed to double the pace as hyper competitive females just shot on ahead. At one point somebody asked when do we get to Ditchling Beacon only to be told that we had passed it thirty minutes ago. Still it was perhaps a good thing, the weather deteriorated and in the low cloud and drizzle we were forced to eat the sandwiches I had prepared (excellent even if I do say so myself) sheltered under the only semblance of cover - a few straggly hawthorn bushes -on this stretch of the route. We got to Lewis (technically not on the SDW) at about 2pm but at least there are things to see there. We stayed at the White Hart Hotel, one of the few places that could accommodate 12 people without charging an arm and a leg. Mixed reviews of the hotel, I thought it was OK but others were less flattering. Best you can say is that it is ready for a substantial refit. "Real Eating" where we had our evening meal was also a bit disappointing - food was OK but produced at a funereal pace. Still there was a really nice pub opposite (can't remember the name, but a real pub) which happily did not serve the famous local beer, Harveys, which is not my favorite. 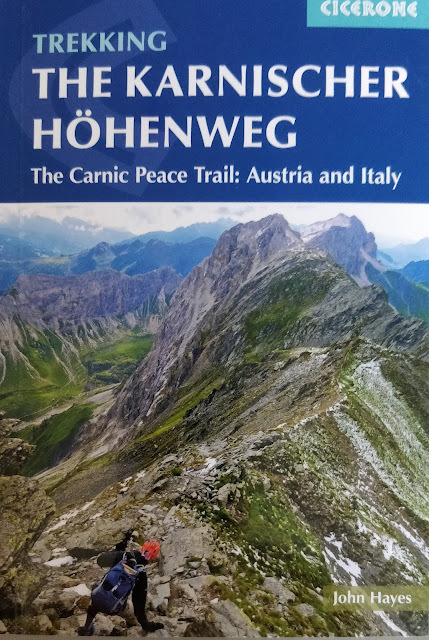 If you want to walk the SDW you really have to go west to east - the walking just gets better and trip builds to a crescendo - and the penultimate day is a great walk helped when we were there by really lovely weather. Rejoining the SDW to the south west of Lewis and after crossing the footbridge over the busy A27 its a surprising nice walk across a sort of heath to Kingston near Lewis before climbing back up to top of the Downs further south. The route is no longer on the northern scarp ridge but on a similar ridge further south. Great views but different to the last couple of days. After a mile or so on top it drops down again to the third of four rivers that cut through the Downs, the Ouse, going through the pretty little village of Southease on the way and missing the village of Rodmell where Virginia Wolf lived (drowning of course in the Ouse). After crossing the A26 it then goes on a lovely gentle climb back to wide open Down with huge views of the valley below, Newhaven with a departing ferry to the south and Lewis to the north. 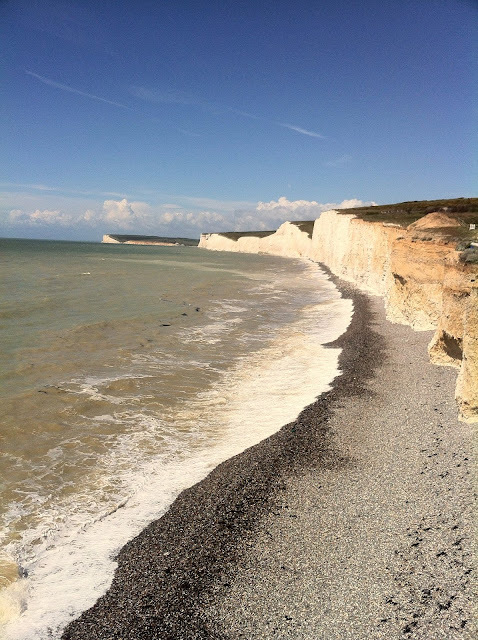 To the south east we can see the huge cliffs above Seaford, a taster of tomorrow's delights. We saw some of them yesterday but today's walk was really marked by lovely herds of cattle grazing with their calves. Roger and Sue, scared by a scary German bull experience when they joined me on the E4 last year, barely notice the six or seven very contented bulls we pass by as we approach Alfriston, these are not the kind of chaps to waste energy chasing people. Dropped down to Alfriston which has everything you need as walker. Quite a small village but with several excellent pubs and a good choice of places to stay and excellent cream teas. Would have liked to have tried The George but at the weekends you had to book for two nights, but The Star opposite was very good. We had an evening meal at The George and will definitely come back, maybe walk to Alfriston from Brighton and then back again the next day. And so the last day and for my money one of the best bits of coastal walking in the country, certainly coastal walking within easy access from London. After the water meadows to the south of Alfriston, and an equally pleasant walk through Friston Forest you drop to Exceat and start on the highlight of the whole trail. The first part, where the River Cuckmere enters the sea, is perhaps best seen from the west side of the valley and views of the cliffs from behind the coast guards cottages are famous, featuring most recently in the film Atonement. It is so stunning that the famous white cliffs of Dover are often substituted by the much more attractive white cliffs of the Seven Sisters. It's then a steady climb up to the first of the sisters followed by the roller coaster across the others all the way to Birling Gap ( I always struggle to identify all seven only really finding six), huge amazing views, and then finally the long climb up to Beachy Head, past the Belle Tout lighthouse (moved inland for temporary relief against the retreat of the cliffs). My favorite bit is the steady climb up to the lighthouse and at a certain point you get a perfect view of the bright white cliffs of the Seven Sisters and the even more impressive cliffs on the other side of Cuckmere Haven. At Birling Gap to can get down to the beach or, as we did, have lunch at the National Trust cafe there. Rather than trudge down from the Beachy Head Hotel into Eastbourne you might, in the summer, think about catching the 13X bus which runs one way in Eastbourne and the other way into Brighton. We did. Just been reading your SDW notes, of great interest as I did the walk in a beautiful week just before last Xmas. Thoroughly enjoyed it despite having to venture into the south. [I live on the edge of the Pennines] Do have to admit you have some beautiful countryside within easy access of the towns and cities. The orchid was an Early Purple which does have blotched leaves, flowers April-May. The spotted flowers June and the flowers are pinker. Nice picture of the Severn Sisters. If you think yours are motley crew you should see my aging walking friends. Just returned from a weeks walking GR7 from Bejis to Morella. Must be one of the best bits of the route so far!! Fantastic scenery,paths and hospitality.Loads of vultures in the warm air every day. Tried sending you a "beware of the bees" photo but don't think I can on this post. Enjoy your rest before France, look forward to your report. Nice to have my suspicions on the orchid confirmed and will enjoy passing on the news onto Dave S.
I thought the Bejis to Morella bit was brilliant as well, particularly nice as it was so unexpected. Going to Dingle for a few days in early July before the French trip - squeezing even more in this year! Really liked Frank's email so have added it as a comment. Very useful correction on silver weed! Harvey's is bilgewater. No idea why it gets bigged up. Try Burning Sky or Longman. Far better both. Bit harsh about Harvey's but Burning Sky and Longman's definitely better, then Dark Star knocks them all backwards!